The Florida Greenways and Trails Council unanimously voted in June to designate the Cumberland to Timucuan Trail as part of the Florida Greenways and Trails System. When complete, the trail will be 38 miles long and will connect two national parks, five state parks, two states, three counties and three towns. 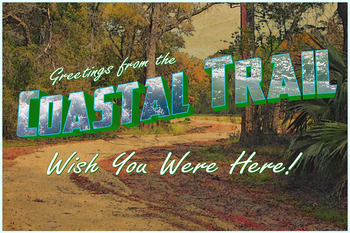 The trail starts at the Cumberland Island National Seashore in Georgia and runs through Amelia Island in Florida. The trail is the northernmost Florida segment of the 3,000-mile East Coast Greenway. "Our community goal is to help Amelia Island become the best place in Florida to safely walk, run or bicycle," said Phil Scanlan, CEO of the Friends of Amelia Island Trail, Inc. "This goal can be accomplished only with team support from our city and county for safe local trail connections, along with state and federal grants for Regional and National Trail paths." Designation will help improve eligibility for both federal and state grants needed to close trail gaps and provide amenities for trail users. The Council also designated the 2,987-acre Hungryland Slough Natural Area in Palm Beach County and the Oak Trails Park and Trail in Broward County as part of the Florida Greenways and Trails System. As we look to the future, the subject of trails is broadening. In the past, we thought of trails with a single identity. However, now with the concept of regional trails connecting communities and various destinations, the concept of a single identity is no longer easy to apply. What is emerging is a set of regional trails with expanded identities that encompass several communities and their individual trails. Those of us in the Florida Greenways and Trails Foundation think this is beneficial because it creates a dialogue between these communities. The Florida Coast-to-Coast Trail is a good example. The trail is composed of several existing trails with strong community identification. This creates an atmosphere of working together toward a common goal - the completion of the regional trail and then cooperatively managing it. 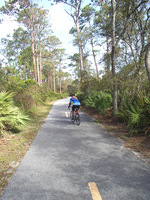 We currently have about 15 regional trails in the works in Florida. These trails are not viewed as competitors but more as groups with a mutual interest of furthering their programs. The Office of Greenways and Trails and the Florida Greenways and Trails Council are putting the finishing touches on a statewide plan for trails. This plan should be completed by this December. Regional trails are a key initiative within that plan. The Foundation will network with the various teams of communities and agencies to further these regional programs. We will continue to focus on connecting communities and finding ways for communities to help each other! This July saw the completion of a 245-foot pedestrian bridge connecting the natural surface trail network at the city of Jacksonville's Cedar Point Preserve to the trails of the National Park Service's (NPS) Timucuan Ecological and Historic Preserve. This bridge project was envisioned decades ago and was realized with the award of a Federal Land Access Program grant in 2016. 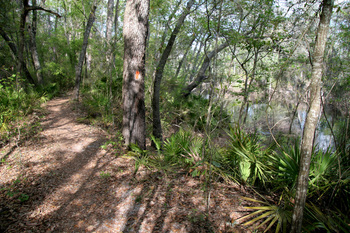 Cedar Point Preserve consists of approximately 631 acres of conservation land owned and managed by Jacksonville. Recreational opportunities include 6.3 miles of trails available to hikers, off-road bicyclists and horseback riders as well as picnic facilities, wildlife viewing and scenic overlooks. The NPS Cedar Point Property is directly east of the city's preserve across marshland and tidal Pumpkin Hill Creek. The NPS property is composed of 420 acres of oak hammock, pine flatwoods and pine plantation and is bordered by salt marsh and tidal creeks on three sides. There are numerous cultural resources including several archaeological sites and the remains of historic structures associated with a plantation. Recreational opportunities include 4.4 miles of trails, fishing, birding and a boat ramp facility with access to the Intracoastal Waterway. Jacksonville and the NPS are part of a partnership along with the Florida Park Service in this area called the Timucuan Trail State and National Parks. The partners collaborate on park planning and resource management to provide a seamless experience for visitors as they navigate from one connected property to the next. Trail connectivity has also been established between the city's Cedar Point Preserve and the adjacent state park property, Pumpkin Hill Creek Preserve State Park, as well as two other adjoining city-owned preserves, Betz-Tiger Point Preserve and Jim Wingate Preserve. Completion of the bridge project marks the last major hurdle to seamlessly connect nearly 28 miles of trails on five adjacent conservation lands totaling 5,526 acres managed by the national and Florida park services and the city. Thirteen paddlers completed the three-day ACA Coastal Kayak Day-Trip Leader course at Lake Louisa State Park in May. The course, coordinated by OGT, trains people to be skilled leaders so paddling is safer and more enjoyable for everyone and establishes more volunteer paddling trip leaders in Florida’s state parks. Russell Farrow of Sweetwater Kayaks and Kim Munshower and Wayne Douchkoff taught the course. Besides trip leading guidelines, several types of rescues were taught. To pass the course, participants had to perform a self-rescue and assisted rescue. The next training will be held in the fall at Lake Louisa. Titusville, located along Florida’s East Coast, was designated Florida's second official Trail Town at the June 2018 Florida Greenways and Trails Council meeting. 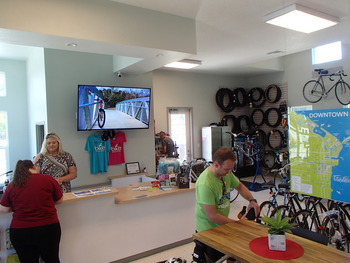 Titusville sits at the convergence of three long-distance trails - Florida Coast-to-Coast Trail, East Coast Greenway and the St. Johns River-to-Sea Loop. The town's steps to becoming a Trail Town included forming a trails committee, spearheading efforts to build a bicycle/pedestrian bridge over their busiest thoroughfare, Garden Street, revamping downtown streets to be more bicyclist/pedestrian friendly, and opening a new visitor center in 2017 that includes a bike shop inside. An eight-minute video produced by the town shows their Trail Town evolution. “We could not be more proud and excited about being designated Florida’s second Trail Town by the Department of Environmental Protection," said Mayor Walt Johnson. “The city recognizes the economic impact and importance of becoming a Trail Town. We continue to work diligently to become the premier destination and Trail Town in the state. Our downtown merchants are excited and beginning to see the increase in their businesses by those trail users who eat, shop, and enjoy our unique offerings." DEP’s Office of Greenways and Trails (OGT) encourages interested communities to conduct self-assessments to gauge their strengths and weaknesses in relation to nearby trails and users. Trail Town candidates fill out an application and are then considered for approval by the legislatively-established Florida Greenways and Trails Council. To recognize Florida’s Trail Towns, designated Trail Towns are featured on the OGT website and given metal signs that can be placed at trailheads and town gateways along with stickers for the windows of businesses. When it comes to Florida trails, there’s a lot to be excited about, especially the opening of a new section of the Florida National Scenic Trail in Big Shoals State Park. This newly added three-mile section of trail between Osceola National Forest and the town of White Springs eliminated five miles of road walking. This kind of connection is the best investment we can make. The full promise of trails is realized when they link different places together. I’m reminded of a story a friend told me about the Tanglefoot Trail, which links the Mississippi towns of Pontotoc and Houston. There was an elderly man named Ron who lived in Pontotoc. Ron had not seen a childhood friend for many years because the friend lived in Houston and neither of them had cars. When Tanglefoot Trail opened in 2013, residents of Pontotoc and Houston could easily cycle between the two towns instead of braving narrow, winding rural roads. His son bought Ron a bicycle, and Ron joined a growing renaissance in the relationship between the two small towns and reconnected with his childhood friend. What really surprised me was that the distance between the two towns was over 20 miles, but the trail and a community cycling club had generated so much enthusiasm that people of all ages were using it. It connected the towns and their residents and provided a fitness opportunity as well. That’s what trails do. They connect us, improving our lives and our health. The designation of Dunedin and recently Titusville as Florida Trail Towns shows that communities of all sizes are investing in trails and recognizing the real benefits and opportunities they offer to citizens. I’m proud of the work that our staff, volunteers, legislators, and partners like the Florida Trail Association are doing to make sure that we’re more connected every day. The East Coast Greenway (ECG) spine route extends 3,000 miles from Maine to Florida. The Florida segment will be the longest trail in any state along the route, spanning 600 miles from Fernandina Beach to Key West. Of the planned 600 miles of off-road trails, over 200 miles are finished and completely off-road. This year, over 25 new miles of trail in four different counties are scheduled to be completed. One of the highest priorities for the Florida East Coast Greenway is the 20-mile Florida City Gap between Miami and Key Largo, where the current on-road travel route is along busy U.S. Highway 1. When the Florida City Gap safe off-road trail is completed, the already completed 35 miles of ECG route between Miami Beach and Homestead — the state’s largest metropolitan area — will be connected to the 106-mile Florida Keys Overseas Heritage Trail, part of the ECG and one of the world's most recognized natural resource and recreational destinations. With major airports along the route, completion of this 20-mile trail gap will open tourism markets to accomplished cyclists and a wide range of walkers, hikers and cyclists. The city of Jacksonville’s 50-mile loop trail project, the Core 2 Coast Loop, is one of the most exciting ECG trail developments to emerge in the last year. Jacksonville issued a proposal for the loop to be added into the ECG spine route. What makes this project so valuable and attractive to the ECG is that the trail will enhance both north bank and south bank developments along the St. Johns River. It will connect through major industrial and business redevelopment areas of the city associated with the Jacksonville Jaguar Stadium area and support long-desired community enhancement and redevelopment efforts in some of Jacksonville's older neighborhoods. In support of Jacksonville and to highlight and add momentum to its Core 2 Coast Loop Trail Program, the East Coast Greenway Alliance has selected Jacksonville to host the 2019 Second Biannual Southeast Greenways and Trails Summit. 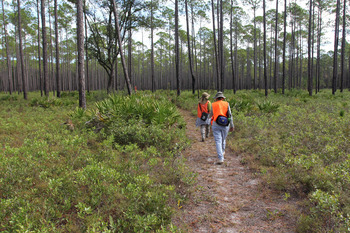 The program will provide a stage for Florida and Jacksonville to showcase the tremendous ongoing trail efforts as well as present the trail industry and trail managers the opportunity to demonstrate trail techniques and materials that will guide the efforts. A new 12-mile segment of the Coastal Trail, a component segment of the Capital City to the Sea Trails plan in Wakulla County, is now open for use. This paved multi-use trail winds through trees along the wide right-of-way of U.S. 98 from the Tallahassee-St. Marks Historic Railroad State Trail to Wakulla High School. Two other Coastal Trail segments are currently being designed and are funded for construction in the next two to four years. The Ochlockonee Bay Bike Trail will connect the coastal village of Panacea to Wakulla High School. A three-mile segment running east of the Tallahassee-St. Marks Trail to Lighthouse Road is currently being designed. "This clearly demonstrates how a project can be completed from planning to construction in five years," said Jack Kostrzewa, Planning Manager of the Capital Region Transportation Planning Agency (CRTPA). "The CRTPA Board needs to be commended for committing their own funds for the environmental study, design and construction of the Coastal Trail. They are truly a group of elected officials who know what it takes to get positive results in a short period of time. We are all excited about this trail and future construction from Wakulla High School to Surf Road." 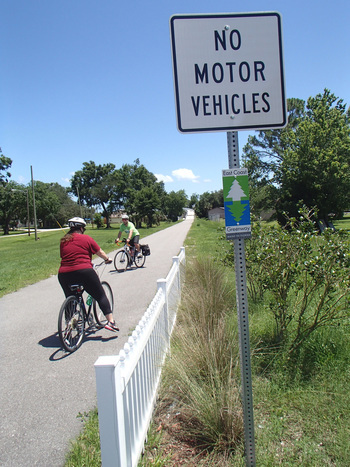 Kostrzewa also credited the Florida Greenways and Trails System Plan, coordinated by the Office of Greenways and Trails, and the Florida Department of Transportation's Shared-Use Nonmotorized (SUN) Trail Program for helping to make the vision come to fruition. A ribbon cutting for the segment will be held in October. It is not too early to prepare for exciting trail events in the fall since many require advance registration. A few are listed here, but be sure to check out the OGT online calendar for more.